Durham-based Jazz and Hip Hop ensemble, The Beast, performed an innovative and electrifying set as Durham locals of all ages and a smattering of college students mingled, sipped artisan cocktails, and enjoyed farm-fresh food. Every month, the Durham Hotel invites local artists to play on their rooftop at no cost to the public. 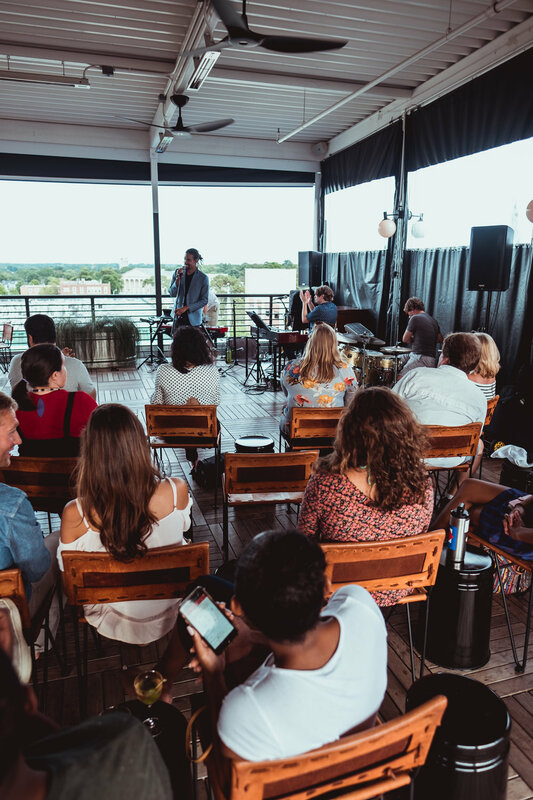 On a warm summer night, the Durham Rooftop jazz series draws Durham residents looking to relax and listen to good music against the backdrop of panoramic views of Durham. The Beast has been creating innovative sounds out of Durham for the past nine years. The lead singer Pierce Freelon, an emcee, professor, and community organizer is also running for mayor in the upcoming elections. For more opportunities to see The Beast and other local artists perform at the Durham, visit their event calendar: https://thedurham.com/event/.